In this lesson, we will begin our work with the number e.
named after the 18th century Swiss mathematician, Leonhard Euler. that of the number π.
π is the ratio between circumference and diameter shared by all circles. e is the base rate of growth shared by all continually growing processes. There are 5 numbers that are considered the "five most important numbers in mathematics". The five numbers are 0, 1, π, e, and i. Now, you know them all! 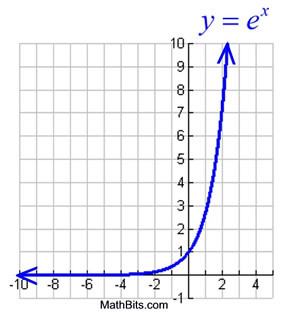 we have the natural exponential function. The natural exponential function may be expressed as y = ex or as y = exp(x). looks similar to the graph of f (x) = bx where b > 1. 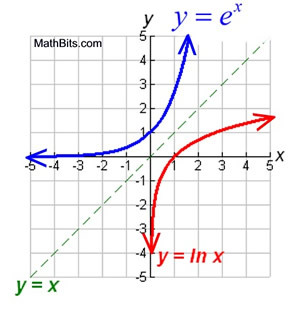 As such, the characteristics of this graph are similar to the characteristics of the exponential graph. 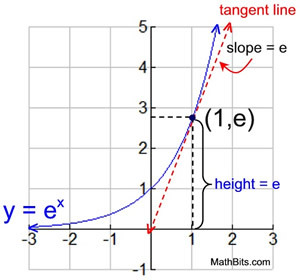 The function f (x) = ex is the only function where the slope of a tangent to the curve at any point is equal to the height of the curve at that point. when you get to Calculus. know that its inverse will also be a function. But what is the equation of the inverse of f (x) = ex ? and is called the natural logarithmic function. y = logb x where b > 1. 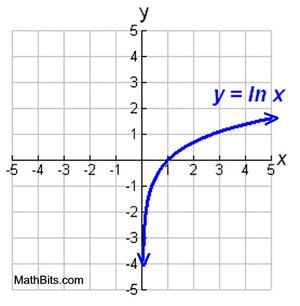 On the Graph: Notice how (0,1) from f(x) = ex becomes (1,0) for y = ln(x). The coordinates switch places between a graph and its inverse. we have the natural logarithmic function. The natural logarithmic function, y = loge x, is more commonly written y = ln x.
looks similar to the graph of y = logb x where b > 1. The characteristics of this new function are similar to logarithmic function characteristics we already know. For help with exponential expressions on your calculator, click here.